Born on French St. Martin, Mercedes Vanessa Brown or Saidy as her family affectionately calls her, had a childhood filled with love by those around her. Raised by her grandmother and uncle on Dutch St. Maarten she did not lack anything. Her uncle and his family raised her as one if their own and her grandmother taught her the importance of religion by taking her to church frequently. She was a quiet girl that loved her home, her family and her friends but like with so many stories this all changed. For her it was at the age of 16 just 2 months away from her 17th birthday when her grandmother passed away and she was sent to live in the Netherlands by her uncle. Her uncle, who has been trying to get her to move since she was 14 was looking out for her best interest. He was convinced that Mercedes would do much better in school abroad than here at home. This was something Mercedes fought tooth and nail in the beginning until she was left with no other choice but to take that flight over the big blue ocean to the Netherlands. Once she arrived in Groningen on a cold December day she was received with open arms by her best friend who quickly helped her get settled in this strange country with strange customs and even stranger people, a country she has only heard of before that first journey. Mercedes has traveled before with her grandmother and their Baptist church congregation to other Caribbean islands like Anguilla, Curacao, Trinidad and the Dominican Republic but never has she been this far from home. Home is where she felt safe and sheltered. In Groningen she quickly enrolled in nursing school. It was the obvious choice for an aspiring funeral home director. A job at one of the local funeral homes is what she wanted, an odd choice for such a beautiful young woman. I was surprised to hear her say this but as our conversation continued I learned why. You see, Mercedes Brown has one thing that she is crazy about and that is customer care. Customer service is a part of every aspect of our daily lives here in the Caribbean, especially on an island like St. Maarten that depends solely on tourism. But customer service is also important in the funeral business. In my opinion what bigger challenge in customer relations than at a funeral home? Unfortunately for our Benz as she is called by friends, difficulties with the Dutch language and with an unsympathetic school councilor made her quit the nursing program. But she was sent to the Netherlands to get an education and an education she would get, so encouraged by friends she enrolled in international business school. Thankfully here classes were mostly in English and Mercedes soon showed her true potential even if business school wasn’t exactly on her wish list. But she grew to love the course and it wasn’t long before she was noticed by the school director, a Scotland native who urged her to enroll in the management program at the Robert Gordon University in Aberdeen in Scotland. This of course was easier said than done for this island girl who missed home terribly. It was no simple task for Mercedes to again leave the comfort of her new surroundings and her friends and plunge into yet another unknown world and so soon after she finally adapted to life in the Netherlands. Once in Aberdeen she was sick and depressed for the first six weeks. “What am I doing here?”, questioned almost daily. She was lonely, cold and sad. At first she stayed with a school friend from the Netherlands before moving to her own place, which she shared with two flat mates. These two flat mates quickly became her new family and the bond is still strong today even though they no longer share a house. Just as she had to get used to her new life in the Netherlands all those years ago she also had to get used to her life in Scotland. The accent and the slang for one is something that she is still trying to master and the gloomy weather (gloomier than Holland) is the other major challenge in her life these days. She now lives completely on her own. I asked Mercedes to compare her life in Groningen, the Netherlands to her life in Aberdeen, Scotland. In her opinion Holland makes it extremely difficult at times with their countless paperwork, taxes over the smallest things and their many rules. But she misses little things like digital maps in buses and metros. Aberdeen still has the old fashion maps in their public transport, which makes it quite a hassle to find one’s location or stop. Holland also taught her how to be independent and that being on time is everything. Both proved to be very valuable lessons that she took with her to Aberdeen. Her charming personality and her wit quickly landed her a job at the Double Tree by Hilton while she attends university. Mercedes is modest as she describes that accomplishment, giving credit to the fact that it is easier for one to get a job in Aberdeen than it is in the Netherlands. She started as a waitress and now, barely two years later she is the new Bar and Restaurant Supervisor. Promoted from waitress to department trainer to supervisor and named employee of the month at least once, Mercedes is living proof that hard work, dedication and taking initiative pays off. Although she is homesick she will give Scotland one more year after she graduates. Her father who has worked in the hospitality industry for quite some years has suggested that she stays as long as she can, since finding a job on the island that pays her what she is worth is almost non-existent. She was shocked to learn that she is valued more abroad than at her own place of birth. She misses island food, the beaches and her family terribly. Island barbeque and johnny cakes are constantly on her mind. The pure island life and having a coconut for no reason are things she misses most. She wouldn’t mind teaching others customer service skills but is afraid that she will get backlash from her peers due to the “Who she think she is?”-mindset and the inferiority complex that is ever so present in the Caribbean. In the meantime Mercedes is looking forward to graduating and getting her bachelor’s degree in management this December. It will be the most important day of her young life, that along with the day she was promoted to supervisor. She has learned to enjoy life in Aberdeen. Her ex flat mates, a St. Maarten friend living in the same town and her manager are who she considers to be her closest friends. She does not go out and party much but rather stays in and writes in her diary. Now and again she tries to explore more of the country she now lives in. 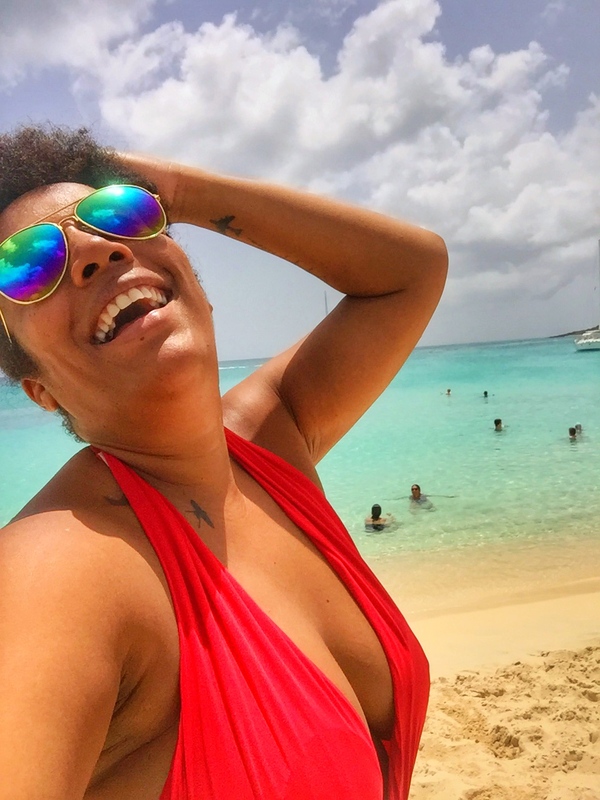 She enjoys visiting other cities, landmarks, castles and the beautiful scenery that Scotland offers but to her it all pales in comparison to the beauty of St. Maarten, an island that her Scottish friends all think is the same as Jamaica. She is now very close to her dad despite the fact that he did not raise her but he is easily one of the main reasons for wanting to move back home. Life is fragile and she no longer wants to miss out on the little things. She describes herself to be fiery, emotional, stubborn as well as passionate and I could easily see why in the 45-minute interview that I had with her. She lives by her motto to inspire and be inspired. One more year, Mercedes. One more year until you’re back home. In the meantime I hope to have done you justice with this little article and look forward to seeing you manage one of our local hotels (or who knows, a funeral home)here on the ever-gorgeous St. Maarten. Keep on inspiring.